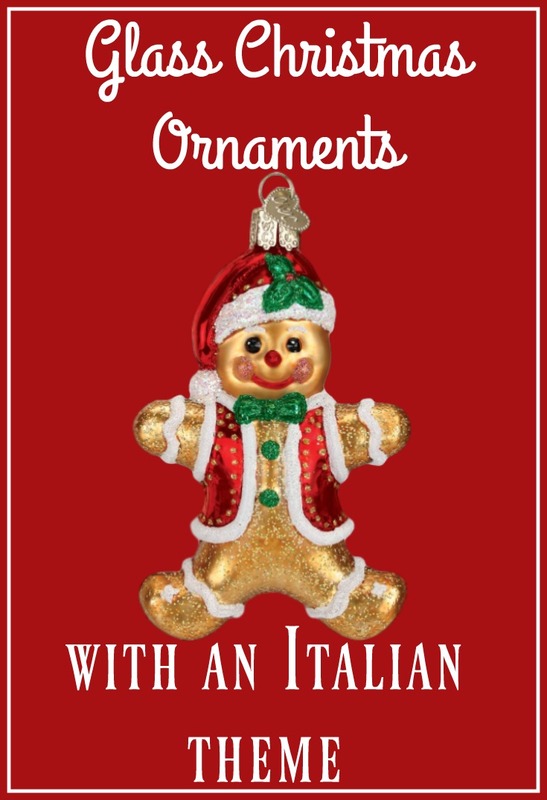 Christmas ornaments - with an Italian twist! A selection of Christmas ornaments with an Italian theme. 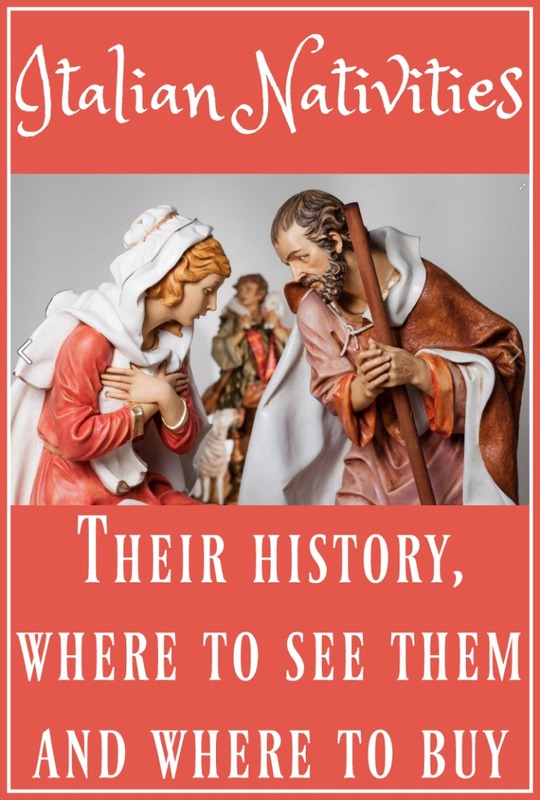 From nativity sets to tree ornaments - you'll find them all here! An Italian "Babbo Natale" by Jim Shore. 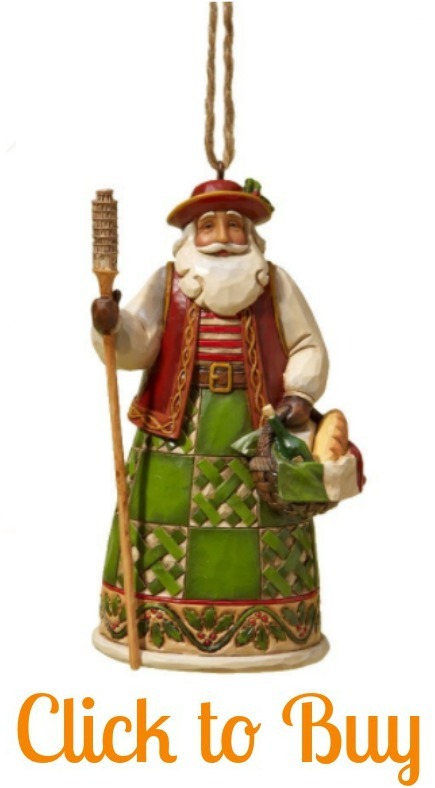 One of Jim Shore's delightful collection of Santas from around the world - part of the "Heartwood Creek" collection. It's the Italian version, of course, complete with leaning tower of Pisa for a staff, and bread and wine in his basket. This one is a tree ornament -- I have the larger version and it's truly an outstanding feature at Christmas. I always receive lots of compliments about it, and several of my friends have bought it, too! Painted in the colours of the Italian flag, the artistry is wonderful - so it's a little disappointing that this particular ornament is labelled "made in China". But that doesn't stop it from being a great addition to your tree this Christmas! It makes a great gift, too - who do you know has been to Italy this year? - They'd love this reminder of their travels! Unfortunately, this particular figure isn't available to buy from the UK, although the larger, free-standing version is available at this link. 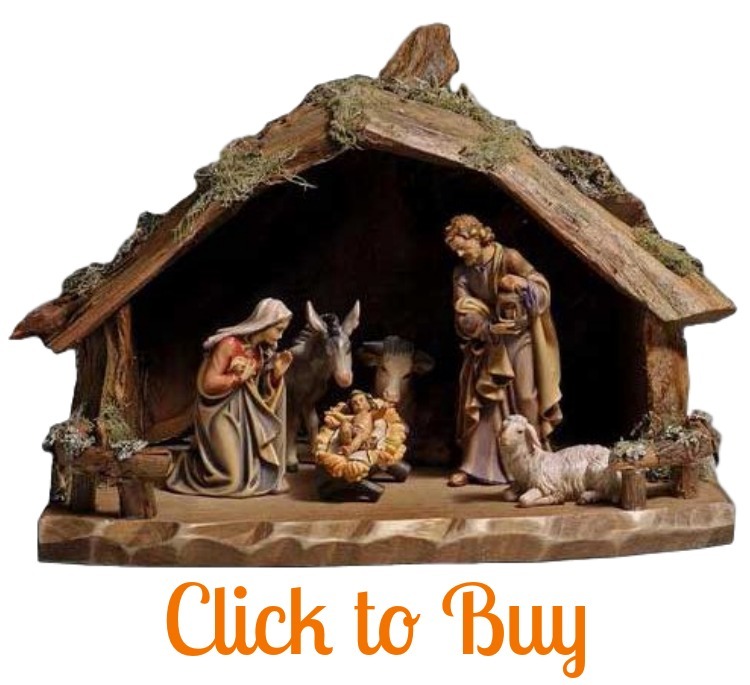 Hand carved in northern Italy - a beautiful wooden nativity set. This beautiful nativity set is hand carved and hand painted in the Val Gardena, tucked away in the Dolomites of northern Italy. It's an area best known for skiing in winter, rock climbing in summer - and wood carving all year round. It's made from "tilia", also known as lime wood or linden wood - a classic wood used for sculpture in the region. This set includes the stable and 7 additional pieces: the Holy Family, the ox, donkey and sheep, and the manger. 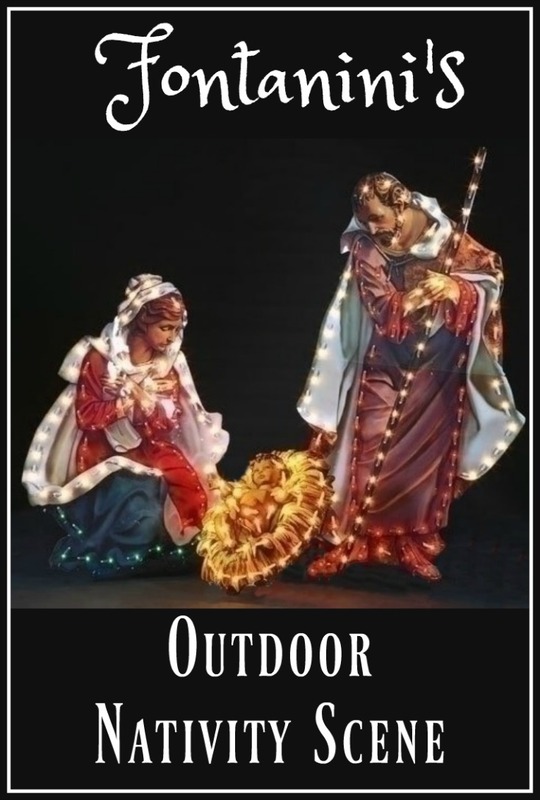 This combines the religious nature of an Italian Christmas with a wood-carving tradition that's been aorund for 800 years. What better way to invite Italy into your home this Christmas? Unfortunately, this item is not available to buy from the UK. We feature many Fontanini sets - they're one of the foremost "Presepi" makers in Italy, and still paint all their nativity figurines by hand. 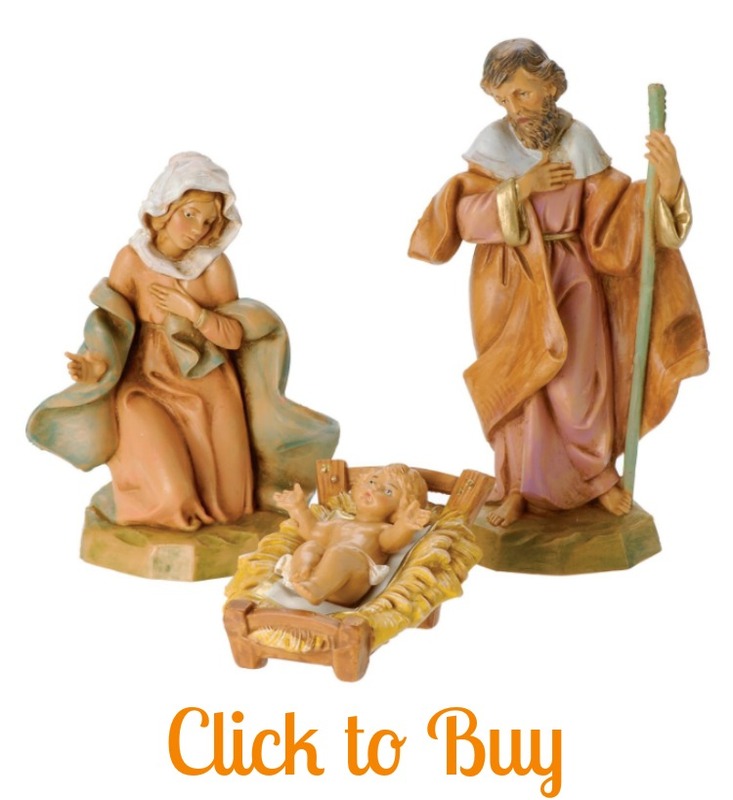 This is one of their more inexpensive items, featuring just the three Holy Family figures. Standing 5" tall, they're ideal if you want to create your own stable scene - or if you just want a simple display without all the additional trappings. The Baby Jesus can be removed from his crib, so if you want to follow Italian traditions and leave him out of the manger until midnight on Christmas Eve, you can. Children love being given the responsibility of placing him there on Christmas Day. Like all Fontanini products, these would make an ideal gift for a young family just starting out. Their figurines will last for generations - buyers always remark on the fact that the colours remain vibrant year after year. If you'd like to buy this set from the UK, please click this link. Novelty glass Christmas tree ornaments. Purely for fun - why not hang a whole prosciutto from your tree this Christmas?! These four glass tree ornaments are made by Kurt Adler, who has specialised in finding and importing detailed, humourous decorations from all over the world for over 70 years. Measuring 4.5" tall, they're very typical of an Italian table: salami, prosciutto, oil and vinegar. They'd make a great whimsical touch to your festive home. An amusing stocking-filler for an Italian foodie! Please note: the "vinegar" bottle is mis-spelt - it says "Vinager". If this annoys you please - don't buy! 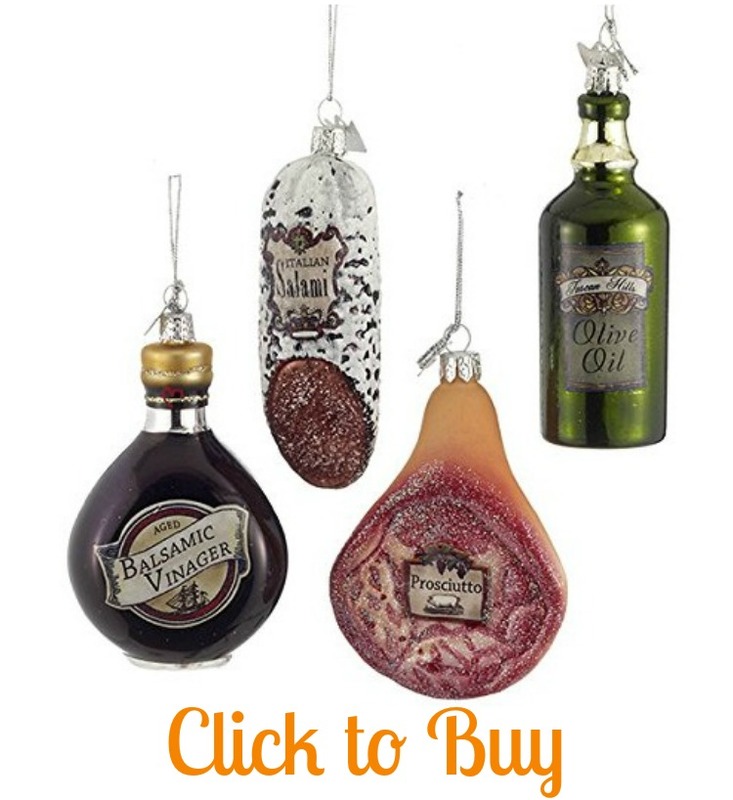 (For more Italian-themed glass tree ornaments, take a look at this page). Sadly, you won't be able to buy this ornament from the UK. If you liked this page, you may be interested in these.